Have you ever looked at the adventure and outdoors magazine rack and wondered "Where are all the women?" A magazine that focuses on the adventure, not the fact that they're female and doing it. A magazine that features real women from all walks of life - in their element. A magazine that sends subscribers kit to test and review. A magazine that shares skills, advice and journeys of women that you can learn from and relate to. Print quality guaranteed to be 100x better than this GIF! All in a beautiful, high quality, perfect bound magazine. Subscribers say it may as well be a book! Unlimited access to ALL the back issues EVER - start reading immediately. Online-only subscribers receive the current issue online once the print magazine has dropped. Exclusive Discount Codes from brands who support our mission. First dibs on new events, expeditions, stash/swag and initiatives. 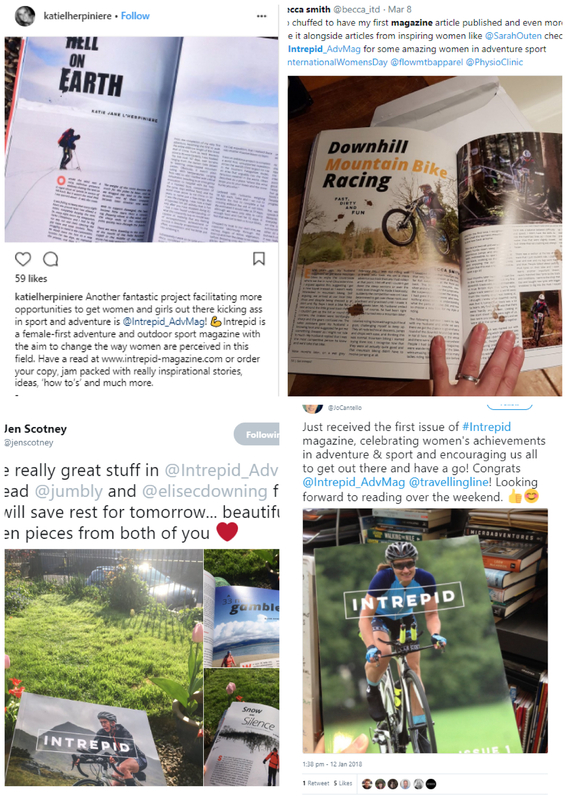 Adventure Bulletin - a weekly dose of what's going on in the world of women in adventure to your inbox. "You've inspired me and I haven't even read it yet."